The University of Cincinnati College-Conservatory of Music’s (CCM) Mainstage Series production of The Hunchback of Notre Dame opens on Thursday, March 7 and continues through Sunday, March 10, 2019, at CCM’s Corbett Auditorium. Directed by CCM Musical Theatre Chair Aubrey Berg, the beloved musical features the college’s student stars of tomorrow with musical direction from Stephen Goers. Based on the Victor Hugo novel and songs from the Disney animated feature, The Hunchback of Notre Dame features the film’s Academy Award-nominated score, as well as new songs by Alan Menken and Stephen Schwartz. Peter Parnell’s book features verbatim passages from Hugo’s gothic novel. Parental discretion is advised. 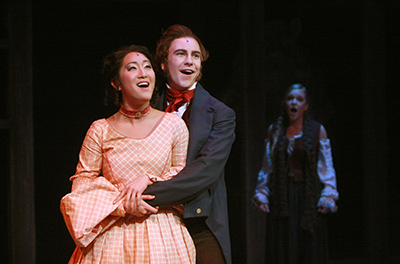 CCM's 2014 production of "Les Misérables" featuring Stephanie Jae Park, who is currently in the US tour of "Hamilton," and Eric Geil, who is in the US Tour of "Book of Mormon." "There is quite a lot to look at, but the stars of the production are the hard-working actors who play a multitude of roles to bring the story to life. They are true ‘triple threats,’ singing and dancing and acting their hearts out to tell this moving tale." The musical begins as bells sound through the famed Notre Dame cathedral in 15th-century Paris. Quasimodo, the deformed bell-ringer, observes all of Paris reveling in the Feast of Fools, but he is held captive by his devious caretaker, the archdeacon Dom Claude Frollo. He escapes for the day and joins the boisterous crowd, only to be treated cruelly by all but the beautiful Esmeralda. Quasimodo isn’t the only one captivated by her free spirit, though — the handsome Captain Phoebus and Frollo are equally enthralled. As the three vie for her attention, Frollo embarks on a mission to destroy the gypsies and it’s up to Quasimodo to save them all. Celebrating its 50th anniversary this year, CCM Musical Theatre took the No. 3 spot in Playbill Magazine’s list of “10 Most Represented Colleges on Broadway” in the 2018-19 season. Cincinnati audiences get the chance to see CCM’s stars of tomorrow perform locally before students move on to the world's stages. Berg first came to CCM 32 years ago to direct Nine as part of the college’s Hot Summer Nights performance series. He says that he particularly enjoyed working on CCM’s productions of Evita, West Side Story, The Secret Garden, Into the Woods and Les Misérables. “None of these would have been possible without the help of my collaborators, the musical directors, choreographers and designers who give their all to teach our students professionalism and discipline,” he adds. Don’t miss your opportunity to see CCM’s stars in the college’s epic production of The Hunchback of Notre Dame on March 7-10, 2019. Tickets on sale now through the CCM Box Office. CCM’s production of The Hunchback of Notre Dame will last 2 hours and 45 minutes, including a 15-minute intermission. Ticket prices start at $32. Discounts are available for UC and non-UC students. Service charges may apply for online orders. Single tickets are on sale now! Tickets can be purchased in person at the CCM Box Office, over the telephone at 513-556-4183 or online through our e-Box Office! Visit ccm.uc.edu/boxoffice for CCM Box Office hours and location. Parking is available in the CCM Garage (located at the base of Corry Boulevard off Jefferson Avenue) and additional garages throughout the campus of the University of Cincinnati. Please visit uc.edu/parking for more information on parking rates.